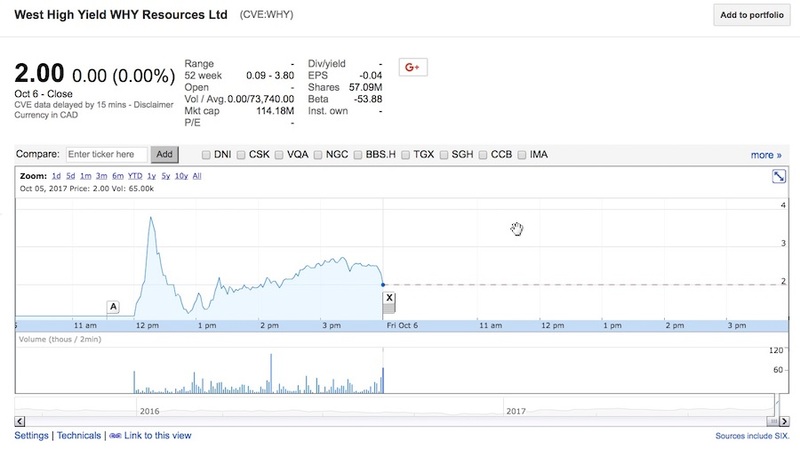 Those holding West High Yield Resources (TSXV:WHY) stock on Thursday were treated to a meteoric rise in the price after it was announced that the company sold its land package of magnesium properties to Maryland-based Gryphon Enterprises for US$750 million. The shares rose as much as 950% – 46 times its market value – on the Toronto Venture Exchange, to a new high of $3.80, before settling to $2.00 a share at the close. The Globe and Mail reports that Gryphon did about five years of due diligence on the collection of three properties, totalling 3,193 hectares near Trail, British Columbia, and the funders went through 18 months, before pulling the trigger on the purchase. "If you calculate the three sections of the land, there is about 3,000 years of supply," President and CEO Frank Marasco was quoted in the paper. "The proposed transaction is great for our shareholders who have been supportive and patient in this very long and arduous process. As we move forward and recognize how important our environment is to our children and grandchildren, we are pleased to see the development of the "greenest element" in the world. Magnesium will support many aspects of our lives including, medical, agriculture, batteries, construction, auto and aero industry and many more applications. Thank you for all your support," he said in the October 5 press release. According to a preliminary economic assessment (PEA) done on one of the three magnesium properties, Record Ridge, the property has 43 million tonnes of magnesium in the measured and indicated category. The M&I magnesium grade is 24.61%, yielding contained magnesium of 10.59 million tonnes. The economic model detailed in the PEA outlines a 42-year magnesium mine with initial capital costs of US$608 million.